TRAVELLERS with early international flights will soon be able to spend the night at Sydney's international terminal at the airport. Rydges Sydney Airport has now opened with a 4.5 star hotel with 11 floors, 318 rooms and half with views over the runway. 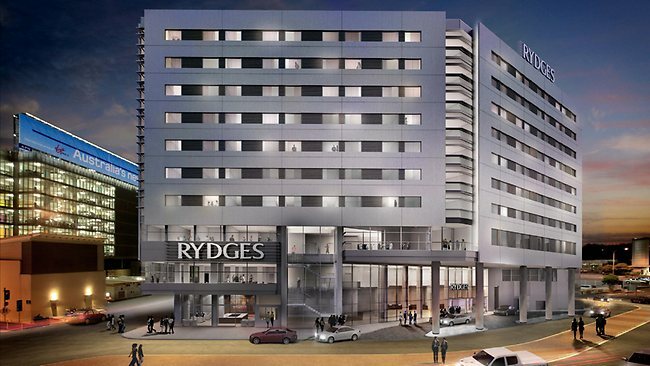 Rydges Sydney Airport hotel allows travellers to walk across the road and check in. The $70 million development was inspired by airport hotels around the world such as Los Angeles, New York, Singapore and London's Heathrow. It's the first hotel to be located at a terminal in the Sydney Airport precinct, with no transport costs to get there and no traffic issues to delay times. The nearest at the moment being about five minutes by shuttle bus. The hotel is very appealing to travellers who want to stay overnight in between a domestic and international flight, particularly as there are a lot of very early flights out of Sydney. The hotel has a restaurant, Blackwattle Grill, and a function room on the rooftop. Having a hotel at the international terminal brings Sydney into line with other cities around the world.